Why don't we escape on a tropical paradise today. There's nothing like a vibrant print and bold color to liven up a dreary day like today. The Toi et Moi Nadia Tropical Floral Print Pump features a classic silhouette but is quite striking in this eye-catching print which features florals of the rainforest. 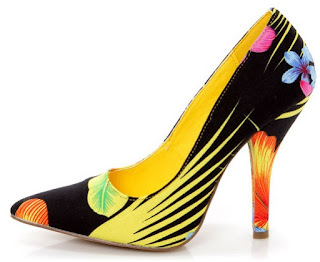 With yellow top-stitching and a 4.5" wrapped cone heel, you are sure to step into paradise with each step. Make sure you hurry, this baby seems to be selling out fast on lulus.com.